Check out my new guide for starting a blog to learn how to go about properly creating your own blog. As I continue my own blogging journey I find myself learning more and more. Combine that with all of my website marketing experience and I guess I have a lot of info to pass on. So what started as just a short term series has grown into a weekly series. Like a boulder rolling down the hill, there’s no stopping it once it gets going. I’m always open to topic suggestions if there’s anything particular you’ve been unsure about. I know lots of you e-mail me random questions that could probably turn into posts themselves. So I guess there’s always my e-mail archives to dig through for topic ideas. I was a little hesitant to cover this week’s topic for a couple reasons. First of all, a certain search engine isn’t too fond of the type of advertising that this post will cover. Secondly I don’t really want to offend the bloggers that I know use these tactics. So if you do use these tactics, no offense meant. I just want to open up discussion about some of these things. As with my post last week about cooperation and competition in blog marketing, it’s becoming evident that I don’t see blogging the same way as most other finance bloggers. Recently my work experience really opened up my eyes to a major issue with how other bloggers handle advertising on their blogs. It all started when I was looking for some advertising for one of my SEO clients. I got into discussions with a well known ad broker within the financial blogging niche. It seemed like we worked out a favorable deal, but little did I know that it was all smoke and mirrors. It turned out that this ad broker was telling all of the bloggers to backdate the posts with the ads. Worse yet she tried blaming the individual bloggers for that issue. This is when a blogger publishes a new post but sets the date to be sometime in the past. Some bloggers just backdate a few days while others push the post months into the past. Essentially they are trying to hide the post from their regular readers. That way readers aren’t put off by ads and they are at less risk with a certain search engine. The bloggers I talked to just assumed that the advertisers only wanted a link. Does that justify taking away other benefits though? Those backdated posts obviously get way less traffic and less people seeing those ads. Plus those pages become weaker since when nobody sees it, nobody is going to be linking to it or sharing it on social media. Also a link is stronger when it is less clicks from your homepage. Those backdated posts were either remaining on the homepage for a shorter amount of time or not appearing there at all. The only time I think this is a legit tactic is when an advertiser explicitly agrees to it. I have heard of advertisers that wanted their ad to go under the radar. In any other situation though, you are shortchanging the advertiser. An advertiser is assuming their ad will be included in a blog’s regular posting schedule. This is similar to the previous tactic, but it takes away much more from the ad. From what I know, it’s just a matter of using some plugin to exclude the post from their main blog stream. That way you can only find the post by going to the exact post url or using the blog’s search function. So not only is this post not going to be found, but it’s even tough for search engines to notice. Since those hidden posts have so few links pointing to them, those pages become extremely weak. The bloggers who use this tactic simply report the exact post url to the advertiser. The majority of the time the advertiser just glances at the post url to make sure the links are ok. Little do they suspect that they’ve just received a post that gets none of the benefits of advertising on a well ranked blog. They get the short end of the stick by trusting those bloggers and being too busy to thoroughly check their ad. I can’t think of a single situation where this tactic would be acceptable. I really advise against this strategy. When bloggers do this they are just not streaming the ad post to the RSS feed. So it’s only being blocked from their regular readers who happen to use an RSS reader to follow their blog. Personally I don’t have a big problem with this tactic, but it does ultimately limit how many people view the post, add a comment or share it on social media. So again it’s not being completely honest with advertisers about what benefits they’re receiving. Some of those advertisers may have targeted your blog partly because of the number of RSS subscribers you have. This tactic is one that advertisers are almost guaranteed to never notice. Most advertisers won’t take the time to subscribe to the blogs that they are probably just advertising on as a one time deal. So while I don’t recommend doing this, you would likely get away with it. Again, this is another marginal offense, but still worth mentioning. It is when a blogger publishes an ad post or multiple ad posts in the middle of the night and then publishes a normal post at their normal morning posting time. It achieves some of the same effects as the other strategies mentioned as it limits how many regular readers view the ads. At least the post is on a blog’s homepage and is not completely hidden. Unless you regularly post like that, it does go beyond what an advertiser would be expecting. I don’t think most advertisers would notice or even care much though. Most advertisers do not actually know enough about SEO to know that they are losing some benefits. I think this tactic can be somewhat acceptable, at least compared to the other tactics. Still I wouldn’t go overboard and publish several ad posts in one night. At least spread those posts out a bit. Bloggers need to think twice about whether they are being true to themselves with how they handle the advertising on their blogs. If you do make the decision to accept advertising on your blog, you should be willing to accept the consequences. If you’re accepting ads, why not only accept quality content that is good enough that it doesn’t matter if there is any advertising? Or if you’re that worried about hiding that content from your readers, perhaps you should be pursuing a different monetization strategy. I realize you are just trying to protect your blog with these tactics, but is it fair that advertisers get screwed over as a result? The other thing to consider is how these tactics affect this monetization strategy overall. I wouldn’t think advertisers would continue paying top dollar for these types of ads if they are not getting the benefits they are expecting. Some might start limiting their budgets. Others might completely move on to other strategies. I really hope I didn’t offend anyone with this post. It was not meant to call out anyone, but instead it was meant to raise awareness for bloggers who don’t realize what they’re doing. Maybe by making the ads more beneficial for advertisers, we can all benefit more. What is your take on these tactics? Do bloggers owe advertisers the courtesy of being upfront? I’m still new to the whole blogging thing. So it’s no surprise I haven’t even thought about advertising. I like this post (and series) and agree with what you said. Good question William…not stupid at all. First of all, advertisers are usually looking for specific stats such as PageRank, Domain Authority, MozRank and sometimes even Alexa Ranking. If you build those stats up some advertisers will likely reach out to you on their own. Some advertisers only reach out to you if you give them the green light by doing things like publishing guest posts, creating a guest post page, creating an advertising page, etc. Also you can make it easier to find you by commenting on a lot of blogs and trying to get on blogrolls. You generally don’t need to reach out to advertisers yourself. That might not be very effective anyway since a lot of companies use marketing firms to handle their advertising. Good post Jeremy! I think what makes it so difficult (to some extent) is that it can be extremely difficult to know who you’re dealing with and fear of how these type of posts may look. to normal readers. That said, I do no believe that this releases us from culpability as bloggers. I believe we need to be on the up and up, otherwise it makes it more difficult for everyone else. The only thing that I do, that I can think of, is keep the post from the RSS. This all just another reason why I am trying to focus on more affiliate advertising. Thanks for your honesty John. That really is a minor offense, but still different than what an advertiser would expect. Readers very well could respond negatively to sponsored content, but ultimately you have editorial control over that stuff. You can reject those articles or improve them on your own. Or you can make other content so good that they’d be willing to put up with some lesser quality sometimes. I am annoyed as a reader to see several posts a week go through RSS. As a publisher, I never dealt with any advertiser that put a condition that you should publish on RSS nor do I include RSS stats when I talk to a rep about a deal. The posts are on my homepage and archives and do get traffic, sometimes pretty good traffic when they really SEO optimize the post. Advertisers don’t mention RSS because it is assumed that the posts get published the same as any other post. I do think that is more of an issue with blogs that publish their RSS subscriber stats on their blog. As for traffic to posts and SEO benefits, do you not think those ad posts would receive similar traffic as other posts if it was published in the same manner? The SEO benefits as a result would be limited as less people socially share and link to those posts. I’m not singling anyone out with this post though. Many bloggers are guilty of these offenses. It’s something that should be considered more in depth. I never even thought about these tactics. 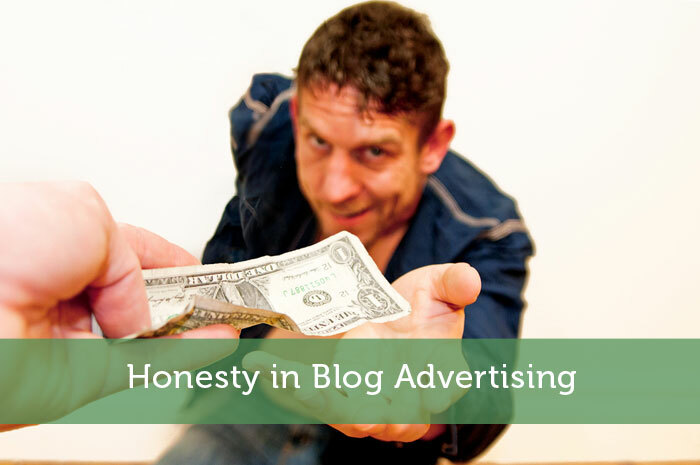 If an advertiser is paying you, then you owe them to be honest. This could easily come back and bite you. Yeah I could see some advertisers not being too happy when they notice stuff like this. I know I wasn’t when I noticed all the posts I bought in that deal were all backdated. It doesn’t make me want to deal with that ad broker again. Or readers might notice some of this stuff and think differently of your blog. I agree with Jayson. Besides, if you are not honest, your readers will also notice it. Eventually, they will also leave. I’m not sure how much readers will notice dishonesty, but they might get a little suspicious when they find posts hidden in your blog with no comments or social shares. Totally sleazy. I only want to make deals with bloggers on a sink-together, swim-together basis. That way, they have to believe in what I offer to want to publish it, and they also are more motivated to do so. Well I’ll bite my tongue on the ‘sleazy’ part since I’m sure that some of my blogger friends probably use some of these tactics. That’s not to say they all know that it is even an issue though. I do think advertisers should get full benefits if people want long term relationships with them. THEY might not know better, but the SEO guy absolutely did. He didn’t tell them to do these things accidentally! Oh you mean the ad broker that I was dealing with. Yes I am sure she knew better than to pull stuff like that. If not, she would not feel the need to blame the individual bloggers. As a general policy, though, if you sell something, you should be crystal clear what it is you are offering and not deviate from that. Trust is important. Good article and I completely agree with the comments you made. I am looking for ways to get advertising on my site soon but will not be doing those tactics. Good to hear Alan. Sure we can do this kind of stuff to publish more ads than normal, but it’s not being honest with advertisers, readers and yourself. I´ve been noticing those backdated ad posts… I´m not sure what I think about this hidden advertisement. I don´t think it´s a bad thing to earn some extra money on something you put a lot of time and effort into, but some of the ways people do it, doesn`t seem legit in my eyes. I prefer honest advertising! I guess bloggers are worried about not all readers thinking that way. By putting the reader first in this way, they are misleading others. The strange part is that most of those people probably wouldn’t mislead people in other circumstances. Luckily you can learn a lot about blogging as you go. You just have to be careful otherwise you could find yourself learning from mistakes. I think a lot of bloggers who do this kind of stuff are in the same boat. They are just still learning. Wow! Never heard of the backdated post idea until today. I also think some of it may stem from this being new territory. 2 months ago I would have never thought I’d be getting contacted by advertisers let alone knowing people were willing to pay for posts. The new territory excuse may be valid for some, but I’d think someone is suggesting these tactics to them. If it is new territory, they wouldn’t think up strategies like that on their own. Some experienced bloggers must be passing on that advice, including that ad broker I dealt with. I honestly think it depends on the advertiser. Not that I have a ton of experience, but I actually had an advertiser who wanted to add a paragraph to an older post. I also had one for a Spanish website. I don’t think they are seeking me out based on traffic. I don’t think you should exclude sponsors from your homepage, but I don’t see how sandwiching between two posts can hurt. I feel bad enough accepting any sponsors as it seems kind of like a sell out, but I also want to make money. The ongoing dillema I guess. If I ever do have tons of traffic and command hefty ad fees, that would be a different story. At that point, I’d probably hope to do more affiliate ads anyway. Good post on some issues many of us struggle with. If an advertiser specifically requests an ad in an older post or doing some other form of backdating, I don’t see anything wrong with it. If an advertiser knows enough about SEO, they’d want their ad close to your homepage for as long as possible, but some of these techniques diminish that benefit. So even if we think they don’t care about traffic, we shouldn’t be limiting their benefits. I’m still figuring things out as I go, and I’ve gotten advice and opinions from many different bloggers, but in the end I have to go with what is right for me, so I’ve excluded sponsored posts from my rss feed, but I don’t have a ton of subscribers either (hmm, I think I need to get working on that). And like Kim, I’ve had advertisers post links on old posts, so knowing that they know that, I don’t feel bad about that at all. I don’t hide it from my homepage at all, but I will post sponsored posts on my off days that I don’t post regularly. That approach sounds fine to me. If you were to grow your subscriber base though it might have to be something that you disclose to advertisers. At that point maybe you can ask for higher pricing for it to be included in your rss. Posting on off-days is perfectly fine too. That is a problem that bloggers face when they accept ads. I know some bloggers insist on writing their own ad posts which is a decent compromise. Or you could specifically negotiate to put links in existing posts only. Very interesting, I had heard of a few of these (not posting the sponsored post in the RSS feed, specifically). I haven’t accepted any sponsored posts so I don’t really have an opinion on how other people run their advertising. But I can say that I’d always want to be honest and fair on my own blog and with my own advertising. Treat others the way you want to be treated etc. If I were an advertiser I wouldn’t want to feel like I’d been cheated. That being said I’m sure they are aware of all of these “techniques” and probably will start specifying their expectations going forward. Speaking as someone who does work as an advertiser, I didn’t learn about these tactics until I became a blogger myself. So no they are not aware of these things. Even if they are aware of them though, should an advertise have to be wary of bloggers being deceptive with their ads? When bloggers are being so open with their personal stories, it is ironic that they are sometimes far less honest about their ads. In private you can 😉 No need to single anyone out publicly. This post wasn’t about any single blogger anyway. It’s instead a commentary on a trend I am seeing with a lot of bloggers lately. As an advertiser myself it is a bit disappointing. I don’t understand why backdating ad posts would benefit the ad marketer. Isn’t the ad meant to be seen by the traffic the site attracts? I would say the reverse is true that the ad should be at the forefront of all other ads. What’s the use of ads if folks don’t see it. No backdating doesn’t help an advertiser other than in the rare situation where they are too paranoid and are avoiding having the post reported as paid. Some advertisers don’t actually care if an ad is seen by anyone, but one shouldn’t assume that all advertisers are in that boat. Jeremy, thank you so much for this series. This stuff is all new to me, and I’ve been looking for a “go to” place as I feel as if I have no idea what I’m doing. This series will be a great help – thank you! No problem Laurie. I’m happy to help. I suggest you read through the other posts in this series if you haven’t already. I think it depends on the terms of your deal with the client. Meaning, if they are just looking for the links on the site, then some of these tactics are acceptable. Backdating is not a good practice though. If you’re going to post something, then post something and date-stamp it the same day. Also, all paid posts are sponsored posts should be available on your homepage and searchable on your site. Period. The problem is that a lot of bloggers are just assuming they know what an advertiser wants without asking them. Most of the time advertisers do want the additional benefits beyond SEO. Great post Jeremy. I think if a publisher is trying to hide a guest post then they shouldn’t be posting the article at all. Regardless of whether they’ve paid for the article to be published or not, the only criteria a publisher should consider is the quality of the post and its relevance to the websites audience. Exactly…a published has a choice to publish a paid post or not. It seems that some of the people using these tactics act as if they have no choice due to the writing quality. Since they have the final say about that content, that is just a cop out. They can improve the content themselves or outright reject it. Or they can not accept that kind of advertising altogether. Where do you fall on the issue of not disclosing something as an ad. I know the theory is that it makes it harder for 10^million to learn that it is paid advertising, but it also does technically violate FTC rules. Well luckily for me the FTC rules do not apply since I am Canadian. For US residents you probably should be disclosing that, but perhaps it can be done in such a way that it is not a huge red flag. I have seen sites that use an image for their disclosure. It’s as much a moral as a legal issue. When people put up affiliate links without disclosing that they’re getting money, I don’t believe anything they say about the product. Good point Jenny. I probably should add a disclosure for that reason on my affiliate ads. Then again, it’s usually only fellow bloggers that even realize that it is an affiliate ad. I haven’t started advertising yet, so this is great information. I actually got my first request this morning, which is exciting, but I still am on the fence with how I want to approach advertising. When and if I do add ads, I want to do it right. Not only to keep you know who happy, but also so I can sleep at night too. 🙂 thanks for the tips and I’m definitely going to look at the other posts you highlighted. Yeah do take your time and decide on the right approach for your blog. With all the work you’ve put into it, you don’t want to take risks with you know who or your readers. There is definitely right and wrong ways to go about accepting advertising. Great post Jeremy! Keep those blog posts about blogging coming, I love them! Wasn’t this your comment on my last blogging tips post Jessica? 😉 I guess you don’t want to share your view on these advertising tactics? lol no I wasn’t calling you our Kathleen. I’ve come across much worse offenders than you. Mostly I just wanted to educate bloggers about advertiser expectations since that isn’t always clear. I didn’t even know about some of these things. I can see why bloggers might do them, but then again, I think, if you don’t want ads or dont’ like the ads or whatever, then maybe you shouldn’t have them on your blog at all, you know? I have some potential advertisers on the line right now, and I’m deciding at the moment if I think they fit my site or not and if they’ll “put off” my readers or not… because if I think an advertiser sorta blows, then I shouldn’t even let them on my blog at all! That’s just the respectful thing to do for the advertisers, for myself, and for my readers. Exactly…if you’re going to accept advertising you have to consider everyone and not just your bank account. Think about how readers will react to those ads. I do overlook whether it will actually help an advertiser since that is really up to them, but if a site has strong SEO strength at least they are getting that benefit. I missed this post when it was originally published but I’m glad to see someone talking about this stuff! I’ve learned through trial and error that it’s usually better to just ask the ad reps upfront. For example, if I have a big post going up on a certain day but the rep wants the post published on a timeline, I just ask, “Do you mind if I backdate this by a day or two?” If they say no, I have to decide whether it’s worth the money for the ad. Many times they don’t mind since the post is still visible on the homepage, but they always appreciate me asking them first. I think it’s super shady to hide posts from archives or from the homepage without permission – there’s nothing in my head that makes that a fair trade for the advertiser. Yep it’s definitely best to check with them first. I know as an advertiser that it can be quite frustrating to see a blogger being sneaky and taking away some of the ad benefits. I do understand that some bloggers just don’t realize that it affects the benefits, but hopefully this post has enlightened some bloggers about this.